After Dinner last night, we retired to our lovely little private tent. Amoeba and I were tired. We’d gotten up before the sun, driven to Vancouver, then bused and ferried another several hundred miles. It was 9 p.m., the sun was just setting and we were ready for some relaxing. I wanted a bath. Ella did, too, and she beat me to the tub. She was pretty upset when I explained that she was just too small and once there was enough water in the tub to turn the jets on, it would be decidedly over her head. I helped Ella out of the tub and prepared the bath. She +peeked over the side at the hot, roiling water and decided she’d just have a shower, thanks. I found the tub exquisite. Amoeba commented that it appeared they were trying to replace it with plenty of fresh water. The rain poured down and the fog came in to the shoreline. 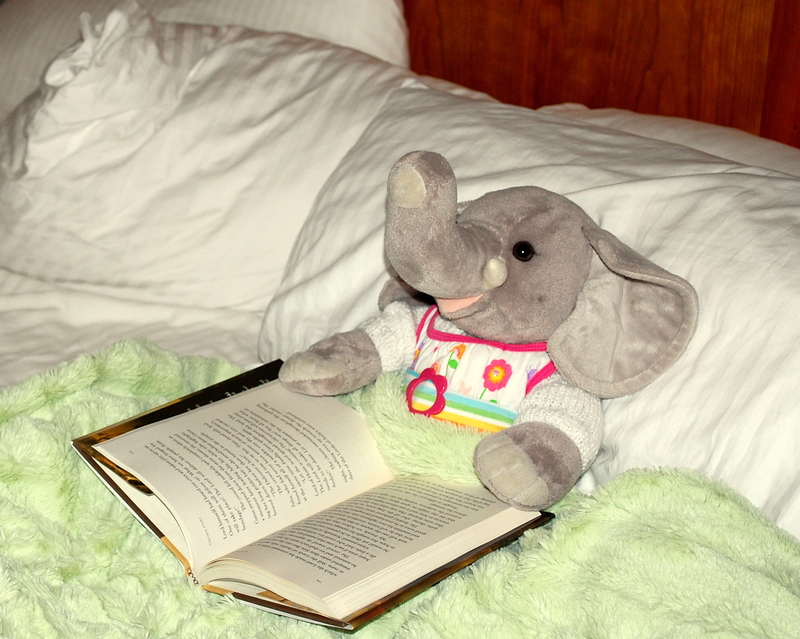 Ella grabbed her book, snuggled back into the covers and said it wasn’t fit weather out for elephant or beast. And then she asked us to go fetch her breakfast from the lodge! You should be snuggled right next to Ella. Nessa — oh no, I was going to breakfast! I think Ellas has the right idea in that last picture! Mocha — while Ella was kicked back on her pillows, I was having sausage, eggs, hashbrowns, bacon, melon, strawberries and blueberries from the breakfast bar. Re: Aw, man. i learned those words for nothing. Nessa — not nothing — just link to them two weeks from now when we all play again! Hope you’re enjoying yourself. I love the Ella Chronicles 🙂 She looks very cosy, but yes, that tub would have been rather large for her. Good thing you stopped her, that could have wound up as a disaster. Teresa — not to mention that she would have used all the hot water and I’d not have gotten my bath! Ella is adorable when she’s reading! ella is getting a bit bossy! That tub sounds just right for the weather you´re having. I would love one of those. I would the weather gets better for tomorrow. Betty — we leave at noon tomorrow! The afternoon cleared up and we did have some fun meeting the locals. Snuggle or breakfast…. hmm, that’s a rough choice. I think I’d go for breakfast too! Susan — since the choice for snuggling was with Ella, bacon sounded better. Had Amoeba not been off to his day’s work I might have reconsidered. Ella knows how to live. You and Amoeba do visit the most wonderful places. Raven — am blessed to have a man able to take me to such places. Ella knows how to vacation! 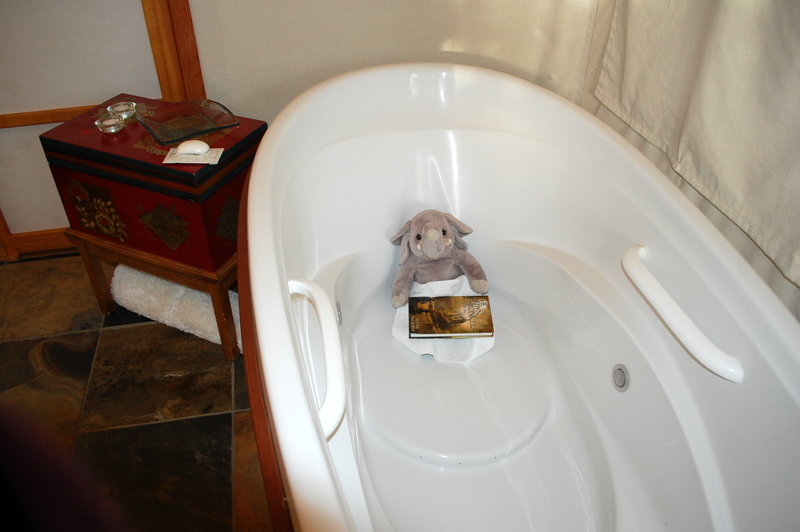 I’m glad to see Ella is enjoying both the book — AND the bath! She really prefers a “dry bath” though… no jets! LOL! Man, I want to stay in one of these tents!